What to make for lunch? Oh, my! There are so many choices. There’s really nothing that isn’t a good choice as long as it’s healthy and has enough nutrients to keep you going for the rest of the day. It’s also a chance to see how clever you are in using last night’s leftovers. You’d be surprised how many foods taste better the next day. Most of us envision lunch as a sandwich with something else on the side. Even if this is as far as you take it, there are a lot of options. Skip the white bread which is widely known to have no nutritional value, and think about whole wheat bread or rolls, or pita pockets or multigrain flour tortillas to make a wrap. Or how about muffins or a bagel? A sandwich on a bagel? Why not? 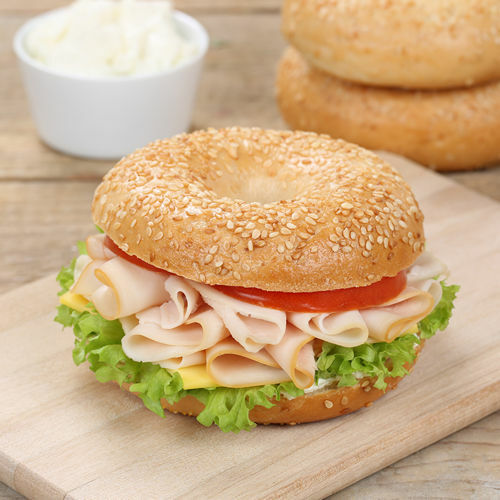 Bagels come with poppy seeds or sesame seeds and other flavors. Yums! As far as spreads, try to substitute butter or mayonnaise with avocado. It taste much better and has a lot more nutritional value. 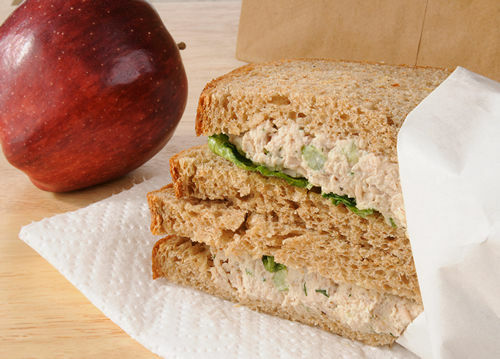 Egg salad, tuna salad, chicken salad, … all wonderful sandwich middles. Please go easy on the mayonnaise. Or take out some of the mayo and replace it with low-fat yoghurt. Add celery and green peppers or even a pickle. You can make all of the ingredients the night before and in the morning, put one of these salads between two pieces of bread, add a sliced tomato and some lettuce and sprouts and you’re done. Add an apple or orange or banana, or a serving of applesauce if you like. 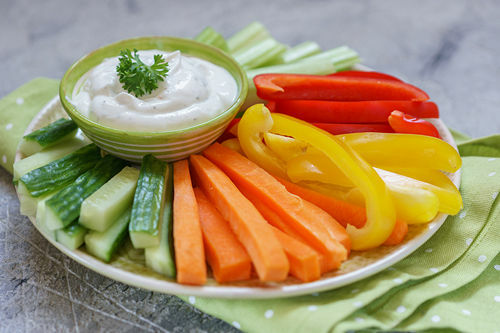 Peppers, carrot sticks, celery sticks or sticks of jicama make great lunch snacks and they’re good for sharing. You can add some low-fat dressing to dunk. You can do an entire lunch with dunking and dipping items. Chicken strips that can be dipped into honey mustard or plum sauce. Fish sticks can be dipped into low-fat yoghurt and dill or tartar sauce. 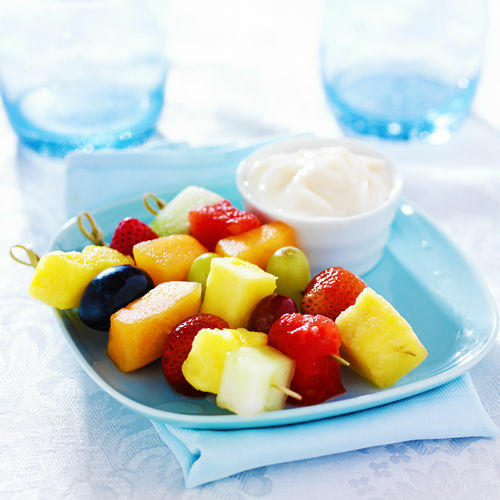 Add some fresh fruit you have cut up and have some yogurt for dunking. Toss in some healthy crackers to add to the crunch factor. Kids love to improvise. None of this will take you too much time and it will look as if you’re putting on a party. Don’t forget about the trusty peanut butter sandwich. Crust on or off? What flavor jelly or jam? Add a sliced banana or green apple. You can also make them on banana bread, or cut them into different shapes with cookie cutters, or use fruit instead of jelly, or what if you grilled them or rolled them up like sushi? For delicate and picky eaters, you can put them on crackers and make them bite-sized. The PB&J doesn’t have to be boring. It’s not a classic for nothing! It’s been popular for a loooong time! If you’d rather do salad and just that, try different kinds of pasta salads. You can use angel hair pasta or funny shapes and then add the protein like meat or chicken or low-fat cheese and lots of vegetables for the fiber. You can also use whole wheat or whole-grain pasta if you like it. Make your own dressing with extra virgin olive oil or avocado oil, if that’s what you have on hand. Keep your salad cold with a cold pack in the lunch box. You don’t have to stop at a pasta salad. There’s also a Chinese chicken salad or a Cobb salad or a fruit salad. If you’re going to make a fruit salad don’t forget to add a side container of yoghurt for dipping or cheese or maybe chicken fingers for the protein. Maybe some granola for extra crunch. Pack the dressing separately so you can add it when she’s ready to eat. That way things won’t get soggy. Soup is always a good idea. Homemade is the best, but if you don’t have the time then canned will do. But please check the listed ingredients for sodium and fat. Especially when it’s cold outside a hot soup will warm every tummy! Keep it hot in a thermos. Pack half a sandwich to go with it and you have the perfect meal. If you’ve ever eaten in a Japanese restaurant, you probably know what a Bento box is. Your meal is served in many containers within an open box. This is now a popular way to serve and eat lunch in a lot of schools. The small portions can be made up of anything. 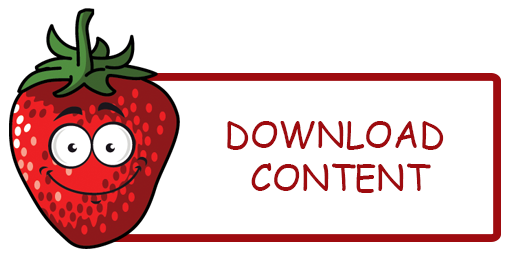 Hard boiled eggs, tiny sandwiches, vegetables… you get the picture. If you have nothing but time, you can make the ingredients look like popular cartoon characters or flowers or animals or buildings. It will amaze your kids, and amaze you that you were able to do it. ☺ This is also something that your child might want to take part in. Come up with the ingredients together and then make the box together. Don’t forget that you can use leftovers and then add fresh fruit and vegetables. You can do this for the child eating at home, as well. You can find the boxes themselves from about $8 – $55. The more expensive ones come with microwaveable containers. They come in all sorts of fabulous and cheery colors. Once you’ve used up your imagination with sandwiches and wraps and roll-ups and dunking and dipping items, there’s always the kebab! Please note that you won’t want to use a pointy stick for these. Try a thin straw instead or a popsicle stick. You can make them up with fresh fruit as a dessert, or with proteins and vegetables for the main course. Some suggestions would be turkey or ham with pineapple, or add cherry tomatoes or cucumber, sliced and folded over. You can add cheese squares, too. You can also pack up a smoothie to go. If it’s good for breakfast or a snack, it’s also good for lunch! And if you’ve packed up a sandwich, this is a good way to get some of the daily fruit requirement in. With most lunches you won’t have to worry about serving them hot or cold. Room temperature will be just fine. But if you are going to make temperature-sensitive food, look into purchasing hot and cold packs. And of course you want a thermos. Do you know what people around the world do for lunch? In Bengali they serve a seven-course meal! In Denmark lunch is light and in Finland and Sweden it’s a full hot meal. In France, lunch is eaten between noon and 2 p.m. and it is the main meal of the day in the South of France. In northern France the evening meal is the main meal of the day. In Germany and Poland it is the main meal of the day and it is traditionally a substantial hot meal, sometimes adding additional courses like soup and dessert. In China lunch typically consists of some form of rice or noodles, but now they’re eating our cuisine as well. A lot of what you make and send your child to school with will depend on what everyone else is doing. Remember those days? 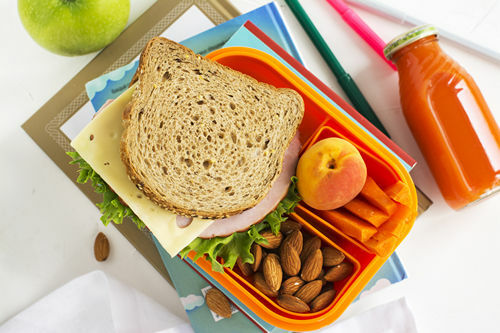 If everyone is brown bagging it, you don’t want to be the kid with the neon Bento box. And if everyone is eating bologna and cheese, you really don’t want to be the kid with shrimp and avocado skewers. On the other hand, you could be raising a trend-setter. But don’t try that more than once if your child comes home crying. Or hungry. Uh-oh. He either dumped his lunch without anyone seeing it, or he had it dumped for him. School can be tough. You also really don’t want to get into a competition with other moms and dads over who can make the fanciest lunch. A little friendly rivalry is fine and can be fun, but the purpose is just to make sure that your kid ate well and was happy about it. Go forth and conquer lunch! 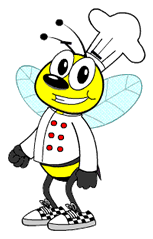 Do you have any fun and healthy lunch ideas or recipes you’d like to share with us?